Own an original Horn! 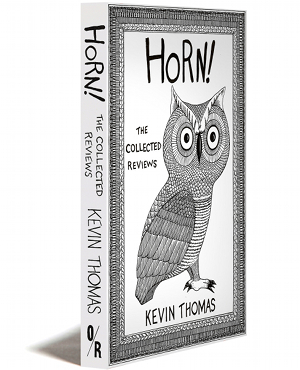 book review by Kevin Thomas. Kevin Thomas combines hand-drawn words and pictures to produce works of art that are witty, erudite and beautiful. You can own one of these original drawings, framed or unframed, by selecting from the list below. Signed by the artist, each unique ink drawing measures approximately 9.5 x 14″ and is drawn on acid-free, archive quality 11 x 17″ paper. These one-of-a-kind illustrations, signed by the artist, measure approximately 9.5 x 14″ on 11 x 17″ paper. Framing in a solid white, handmade maple frame is available for an additional $150. Email horn-originals [at] orbooks.com with inquiries or to purchase. Most reviewers take thousands of words to do what Kevin Thomas does in nine exquisitely detailed black-and-white panels. Using his captivating illustrations and no more than a handful of words, week by week Thomas decrypts some of the most intriguing books of our day for readers of The Rumpus: now eighty-five of his favorites are collected in one volume.